From romantic ruined castles to mysterious stone circles, from frivolous follies to crumbling towers by the sea, there is something about ruins that excites our imagination - and the National Trust has many of the best examples in Britain. 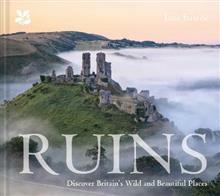 This is a heavily illustrated celebration of these wild and wonderfully atmospheric places across the country, dating from Roman times to the twentieth century. From Cornwall to Scotland, the book is organised by region and includes overview maps, so you can plot your own journey around Britain's remarkable ruins. Jane Eastoe has been a journalist and author for over 25 years. She was chief contributor to the National Trust Book of the Countryside and is author of Home Grown Fruit, Allotments and Britain by Bike, published by National Trust Books. She is also the author of Pavilion's bestselling Vintage Roses and Peonies.